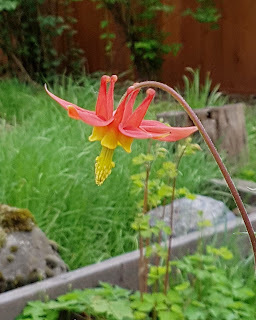 Rain and cold (still, feels like March, not May) and too many other things going on have left me with too little time for garden work. The rain has made the garden verdant, and despite the lack of sun and warmth there is now a lot in bloom. In bloom: Achlys triphylla, Aquilegia formosa, Carex mertensii, Cornus nuttallii, Crataegus douglasii, Deschampsia cespitosa, Dicentra formosa, Dodecatheon pulchellum, Fragaria vesca, Gaultheria shallon, Heuchera micrantha, Maianthemum dilatum, Maianthemum racemosum, Maianthemum stellatum, Penstemon fruticosis, Ranumculus occidentalis, Rubus parviflorus, Viola adunca, Viola glabella. Not quite in bloom: Camassia quamash, Viola adunca. Passing: Amelanchier alnifolia, Berberis aquifolium, Berberis nervosa, Dryas octopetala, Rubus spectabilis. Gone past: Acer circinatum, Berberis repens, Erythronium americanum, Erythronium oreganum, Oemleria cerasiformis, Ribes aureum, Ribes sanguinium, Trillium ovatum. 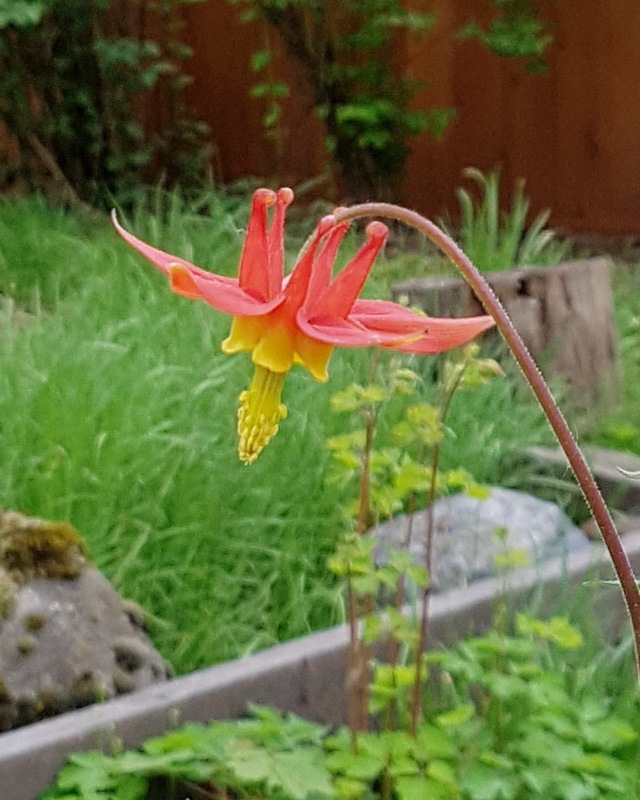 The red columbine above was too beautiful not to include. I don't usually take great pictures of these plants and flowers, but sometimes the subject does the work for you. The shrubby penstemon (left) has struggled for years and has never really grown, but it does tend to produce flowers. This year the flowers are quite lovely, although won't last long. I'm sure this plant needs a better site. 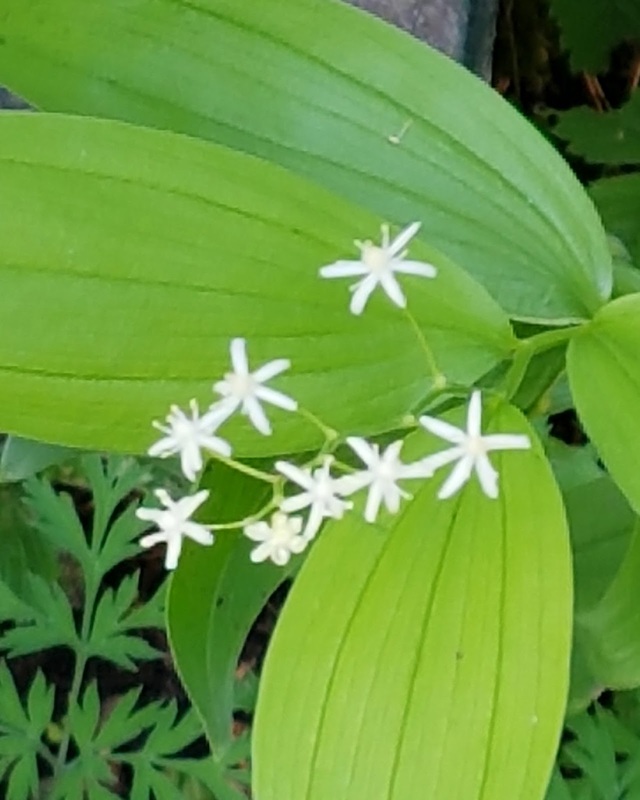 It took me years to figure out the difference between false Solomon's seal and star-flowered false Solomon's seal. I'm going out on the limb to say the one below is the star-flowered one. The other species makes larger clusters of flowers that also have a certain star-like quality, but they are more three-dimensional and less obviously star-like. As well, false Solomon's seal is a larger plant that grows in a cluster and spreads only slowly, whereas star-flowered false Solomon's seal grows in small individual plants (from rizomes) and spreads more quickly. Then again, I might have this totally reversed! But I don't think so. I am continuing to bring some order to the wilderness. In the fern garden, the false lily-of-the-valley had already pretty much sorted itself out with the vanilla leaf, which has mostly gone onto the other side of the path. I got rid of both where ferns were being overwhelmed. Everything is still growing together, just not all on top of each other. I have done this to some of the other beds as well. A little more order isn't a bad thing. On the other hand, I'm doing little about the bed under the birch and bitter cherry trees. That got rather messed up by fence construction and was already in poor shape before. 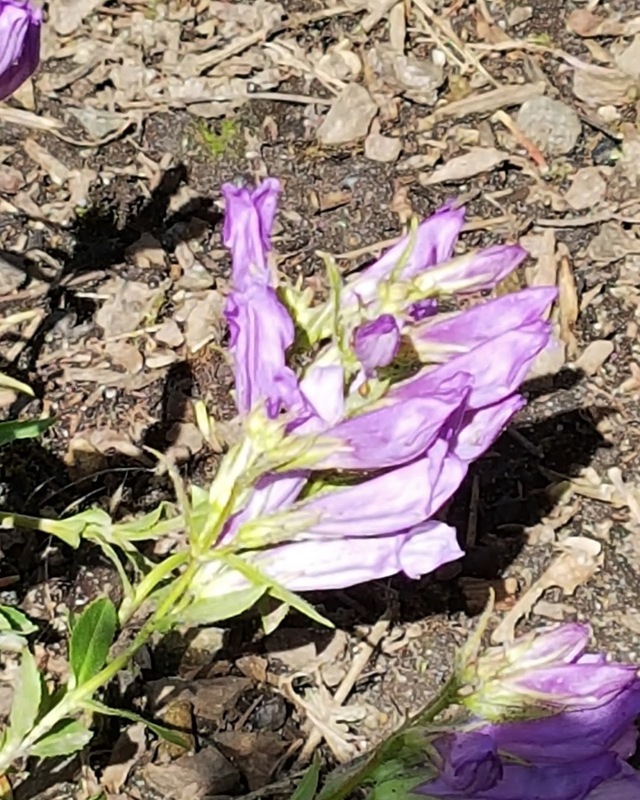 The two species of penstemon all matured and gave up for a while. Only the ovatus is coming back. The large-leafed lupins are also coming back on their own. But it's all rather chaotic right, with invasion by strawberry and violet and even a stray columbine. I'm going to see what happens as they sort themselves out. The soil might need some amending as well.